I offered to run the group for two sessions for one of the midwifery teams . The last time I’d “led” a group was in the late 90s since those years have slipped by I’ve gained courage knowledge and insight into how normal birth can actually be . The staff at the children’s centre where the group was held were amazing – they’d set up drinks and snacks in the middle of the room and it was a friendly relaxed atmosphere. The people arrived- “future parents” all excited about learning but at the same time doubting their own abilities – my job was to make them leave the group feeling and thinking differently than when they came. I really wanted to give them a thirst to seek out more information . I promised them all I’d do my best to give evidence based advice and that I’d back it up with written evidence so they could read about it afterwards . I also gave out mum and baby care plans that have information in about signs and symptoms of illness , postnatal recovery , investigations , discharge planning and what midwives check for after the birth – I did this as sometimes these documents are rarely looked at by parents until they go home and I wanted them to see in advance their packages of care to make it all more real and current. – so I then launched into the benefits of skin to skin and they were hooked. I made sure I stopped every 8-10 minutes to allow questions and gave out post-it notes for questions – we laughed together practising breathing techniques and we also became emotional when we all discussed mental health issues and I talked about my own experience of post-natal depression . Putting myself in the spotlight was quite tough but I just knew that if I said it they’d accept it’s existence- in some small way this might just break the stigma around mental health. The group were soon bonding and the characters surfaced – “Jenny you do realise next week England are playing ?” …..but hang on this is your first baby ? but then I said let’s have a plan and make the class earlier – I kept thinking that it’s good to be flexible in all matters around birth so why not times of the group? Week two -arrived and I was so thrilled that everyone had arrived- in the back of my mind perhaps my conscience was telling me that only half the group would arrive – they wanted more – and so did I . We recapped on the first week and they all excitedly told me how nice it was to read the care plans and think about their babies – we then talked about One Born Every Minute as there was a Hypnobirth on this particular week and they were all really amazed but also said that the birth had backed up what I talked about the week before i.e. believing in their abilities (never thought I’d be discussing OBEM ! Then skin to skin came up and some had asked their parents about it and really researched the subject (proud!) 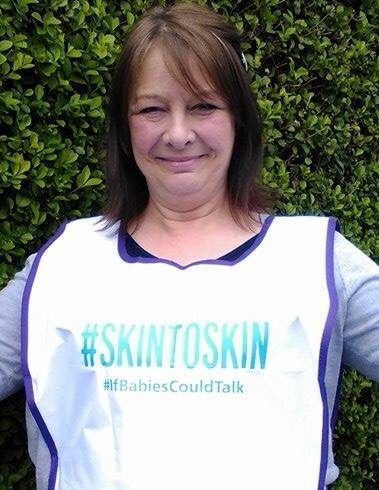 – we staged a mini production called “I need skin to skin” in which another health professional enters the room after the woman has given birth and tries to move the baby – I really felt amazed by their power and passion for skin to skin – my little signs around the place on post it notes, my phone cover and even mini stickers had worked ! We revisited breathing and all had a huge attack of hysterical laughter – but I liked this very much as I imagined them breathing in labour and recalling the laughs they had with me.